Heroes, Heroines, and History: Summer Vacation! Summer is here, and for many Americans, that means it’s time for a vacation! Summer vacations can be as simple as a day trip to the beach, or as entailed as an extended holiday in a far off country. But vacations weren’t always as commonplace as they are now. According to Cindy Sondik Aron’s book Working at Play: A History of Vacations in the United States, Colonial America thought vacations were equivalent to idle time. They believed that work made a person closer to God and so only the lazy took off time from work. By the end Eighteenth century, it became fashionable for the wealthy elite in America to take medical vacations. Hot spring resorts were the Victorian’s equivalent to our Disney World. Granted most of the hot springs bathers had no serious medical needs, but being seen at a hot springs resort was the trendy thing to do in that day. 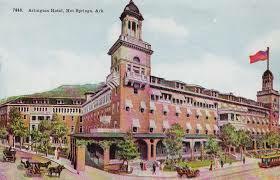 In 1875, the three-story, one hundred and twenty room hotel, The Arlington opened in Hot Springs, Arizona. The state of the art resort boasted gas lamps in every guest room, a grand court between the structures’ two wings and colonial porches that ran the full length of the building to Hot Springs Mountain. In the late 1880s, approximately a hundred more rooms, a new dining room with electric lights, and another parlor were added. In 1893, the original building was razed to make way for a new 300-room Spanish Renaissance structure. The new Arlington was referred to as “the most elegant and complete hotel in America” in Charles Cutter’s 1892 Guide Book. Close to the turn of the century, East coast, ocean resorts became popular. Like the hot springs hotels, these catered to the rich and famous Victorian. The Ponce de León Hotel was an exclusive hotel in St. Augustine, Florida, built by millionaire developer and Standard Oil co-founder Henry M. Flagler. The building was completed in 1888 and was the first of its kind constructed entirely of concrete and local coquina stone. The hotel was wired for electricity at the onset, with the power being supplied by D.C. generators from Flagler's friend, Thomas Edison. Henry M. Flagler had to hire a special staff to turn power on and off for his residents who were too afraid to touch the switches. 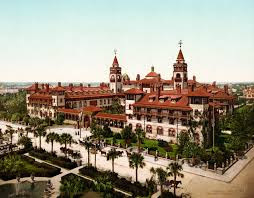 The building and grounds of the hotel are today a part of Flagler College. By the 1950’s, middle-class America had discovered the advantages of taking time from work to vacation, and theme parks began to grow in popularity. Cedar Point in Sandusky Ohio, Six Flags over Georgia, Disneyland California, Disney World in Orlando, and on the west coast of Florida, Busch Gardens, these are just a few of the thrill seekers destinations. Interestingly, 1947, Weeki Wachee State Park in Hernando County Florida, boasted the only mermaid adventure show in America and people flocked to watch the magic of mermaids “dance” underwater. My family and I just got home from a week trip to our home state, Michigan. 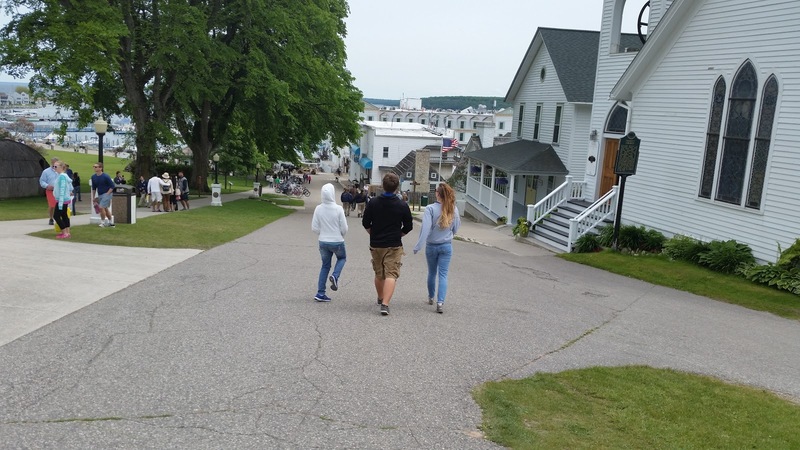 We stopped in Sault Saint Marie, Mackinaw Island, and Saint Ignace. We loved every moment and are already planning to return next year. This time we want to travel further into the Upper Peninsula of Michigan. I can’t wait! Are you taking a holiday this summer? Someplace new or are you returning to a favorite destination? I’d love hear about your adventures! Will you share your vacation plans with us? Remember, for safety reasons, never post on any website or social media when you plan to be away from home. 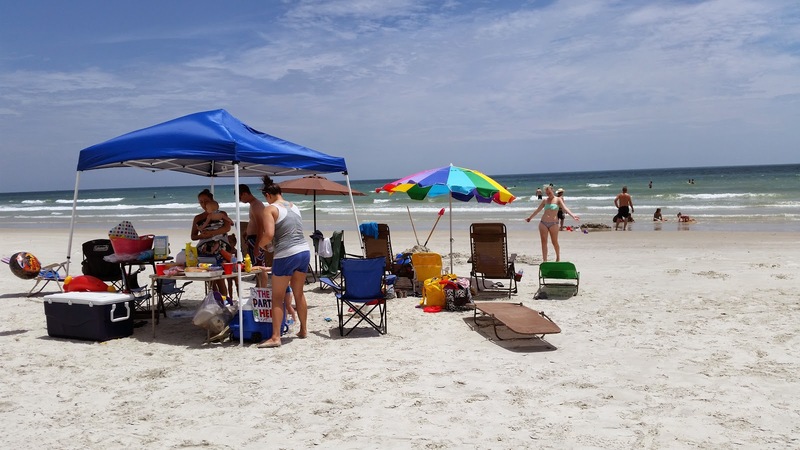 Though vacations have changed through the course of time, one thing has stayed the same . . . we come home refreshed and ready to return to work so we can save our money for the next adventure. I wish you happy and safe summer adventures, HHH readers! Sharon, I would love to visit Seattle. There's so much colorful history there. Thank you for the comment! I agree, Vickie! I love vacations too. Vacations are exhausting, but so refreshing. What an exciting opportunity to go to Yellowstone AND a writer's retreat! Safe travels to you!